Western blot analysis of extracts from SIRT5 wild type (WT) and knockout (KO) mouse livers using Malonyl-Lysine [Mal-K] MultiMab™ Rabbit mAb mix (upper) and GAPDH (D16H11) XP® Rabbit mAb #5174 (lower). 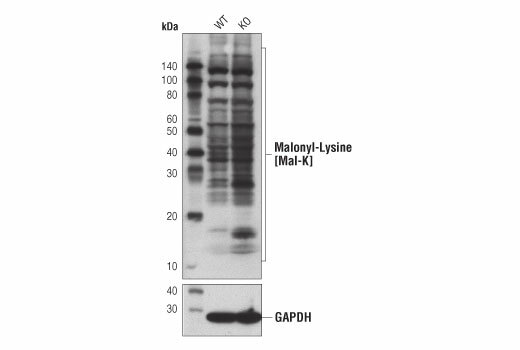 Malonyl-Lysine [Mal-K] MultiMab™ Rabbit mAb mix recognizes endogenous levels of proteins only when malonylated at a lysine residue. This antibody does not cross-react with other lysine modifications. MultiMab™ Rabbit mAb mixes are prepared by combining individual rabbit monoclonal clones in optimized ratios for the approved applications. Each antibody in the mix is carefully selected based on motif recognition and performance in multiple assays. Each mix is engineered to yield the broadest possible coverage of the modification being studied while ensuring a high degree of specificity for the modification or motif. Lysine is subject to a wide array of regulatory post-translational modifications due to its positively charged ε-amino group side chain. The most prevalent of these are ubiquitination and acetylation, which are highly conserved among prokaryotes and eukaryotes (1,2). Acyl group transfer from the metabolic intermediates acetyl-, succinyl-, malonyl-, glutaryl-, butyryl-, propionyl-, and crotonyl-CoA all neutralize lysine’s positive charge and confer structural alterations affecting substrate protein function. Lysine acetylation is catalyzed by histone acetyltransferases, HATs, using acetyl-CoA as a cofactor (3,4). Deacylation is mediated by histone deacetylases, HDACs 1-11, and NAD-dependent Sirtuins 1-7. Some sirtuins have little to no deacetylase activity, suggesting that they are better suited for other acyl lysine substrates (5). SIRT5 is a predominantly mitochondrial desuccinylase and demalonylase (5,6). In the absence of a known malonyltransferase, nonenzymatic protein malonylation is likely driven by the concentration of malonyl-CoA and intracellular pH and is subject to metabolic fluctuations (7). Malonylation is especially prevalent among mitochondrial metabolic proteins. In type II diabetes mouse models, notably elevated malonylation can be detected mainly, but not exclusively, on proteins of glucose and fatty acid metabolism (8). Yeast histone H3K56 malonylation suggests poor DNA binding efficiency and may lead to reduced cell viability (9). Liu, Z. et al. (2014) Nucleic Acids Res 42, D531-6. Lee, S. (2013) Toxicol Res 29, 81-6. Lin, H. et al. (2012) ACS Chem Biol 7, 947-60. Zhang, Z. et al. (2011) Nat Chem Biol 7, 58-63. Du, J. et al. (2011) Science 334, 806-9. Peng, C. et al. (2011) Mol Cell Proteomics 10, M111.012658. Newman, J.C. et al. (2012) J Biol Chem 287, 42436-43. Du, Y. et al. (2015) Mol Cell Proteomics 14, 227-36. Xie, Z. et al. (2012) Mol Cell Proteomics 11, 100-7.